Heig-boy features ColorIt functionality, which allows gamers to colorize their own games, with a script-based system. This system has been refined for the occasion. A new parser has been written and included in Heig-Boy, and VBA CE has been updated with it. 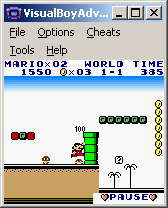 Finally, a GUI to colorize your games more easily completes the collection. 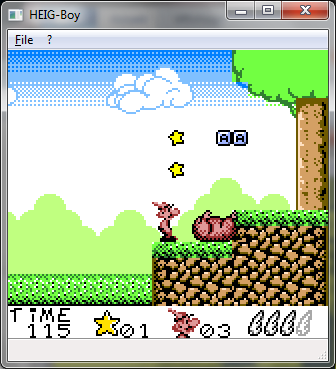 On this page, you will be able to download Heig-boy and find resources about ColorIt, including a documentation on how to implement it in your own emulator, with some samples and the pre-written parser. This is the current version of Heig-Boy. Includes source. Requires the Visual C++ 2008 redistributable package (you can download it here). This is an alpha (but still working well ) version of ColorIt Painter, an easy to use GUI for colorizing your Game Boy games. For now, prior knowledge of ColorIt is recommended, in order to better understand the concept of scenes, and the limitations of the system. La documentation en Fran�ais est disponible ici. Includes a PDF and some code to help you integrate ColorIt in your own emulator. 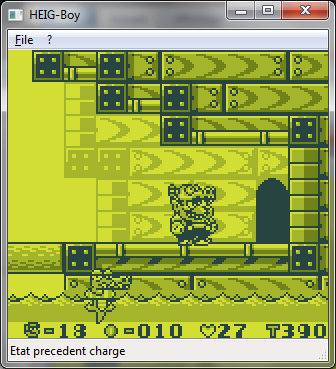 This is a modified version of VisualBoyAdvance, which supports the colorization features of MasterBoy. Currently it is designed for development, I'll make a cleaner version later: just make a file named your_rom_name.pal.ini in the same directory as the ROM you will load, and follow the instructions of the documentation on colorization (available below). VBA CE will use this colorization file, and something interesting is that if you disable Emulator > Pause when inactive window, VBA will show the new palette on the screen instantly after you save your .pal.ini file. Very useful for testing. Sources of my VisualBoyAdvance modification. Documentation on how to colorize Game Boy games with MasterBoy. Documentation sur la colorisation des jeux Game Boy avec MasterBoy.